About: Waxy's Little Sister is the sister pub to Waxy's O'Connors, offering traditional Irish hospitality and food in a candlelit environment. They also have a sofa bar upstairs with views over Wardour Street. They can cater for private parties of up to 150 guests and in the sofa bar from 40 to 80 guests. 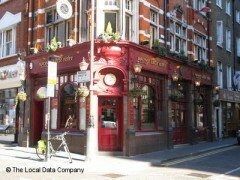 Great location, decent guiness, good friendly atmosphere. What more could you ask for?